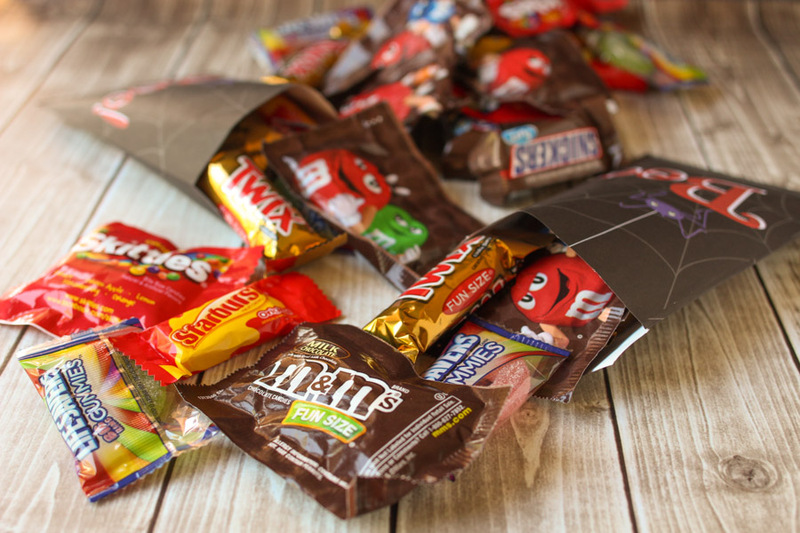 What you do is fill a Halloween bag with candy and other goodies and then leave it anonymously on a neighbor’s porch. Tucked inside, they will find a little note telling them that they have been “BOO’d”. Their job is now to pay it forward and leave a gift secretly on another neighbor’s porch. Not only do you get to deliver treats, but you create a spirit of good will all throughout the neighborhood. 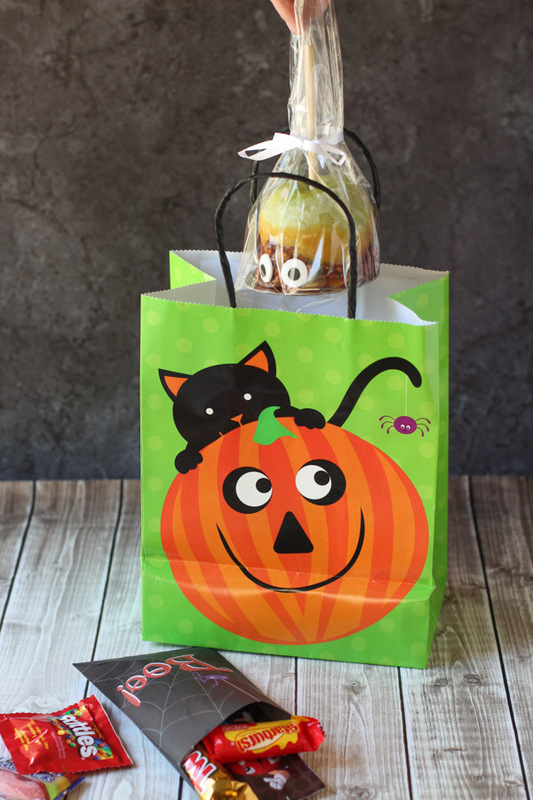 BOO Bags are super easy to assemble. 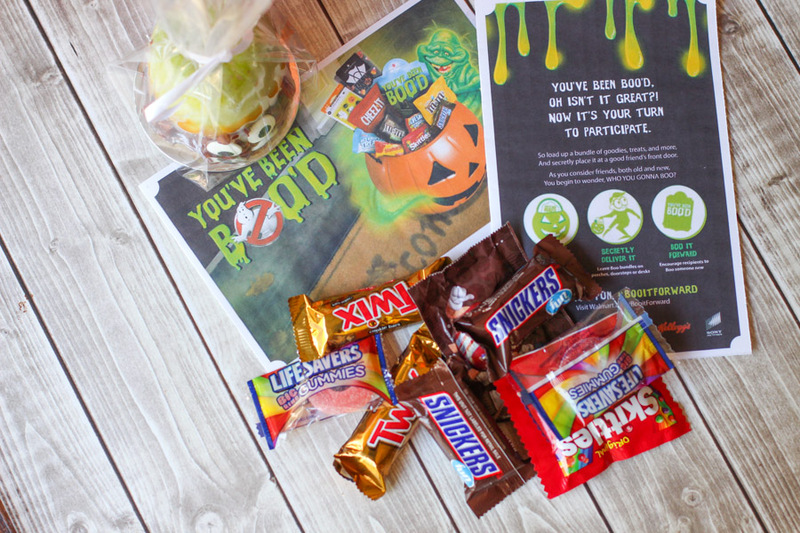 I chose TWIX®, SNICKERS®, M&M’s®, Life Savers®, Skittles® and STARBURST® for our bags. I stuffed the sweets in a little treat bag along with a Monster apple. Oh, yes… let’s make a monster apple. 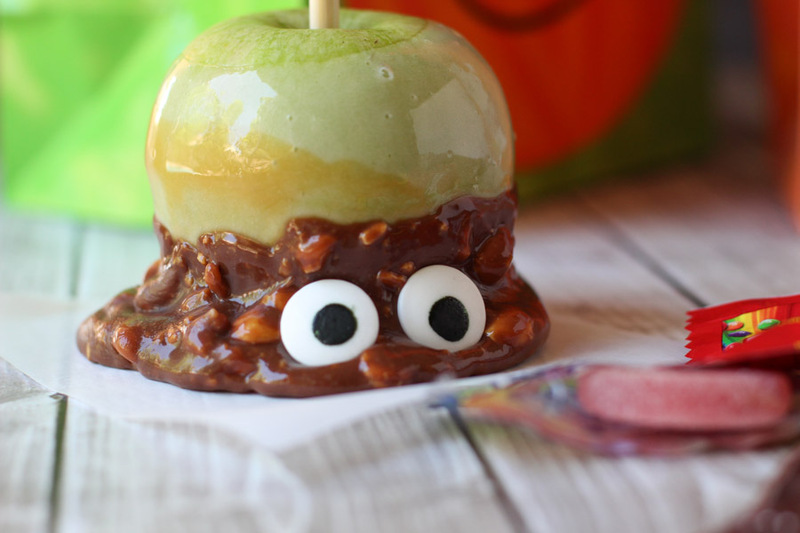 These treats look spooky and require absolutely no experience making caramel apples. The point is for all the toppings to settle at the bottom for a spooky molten monster mess. 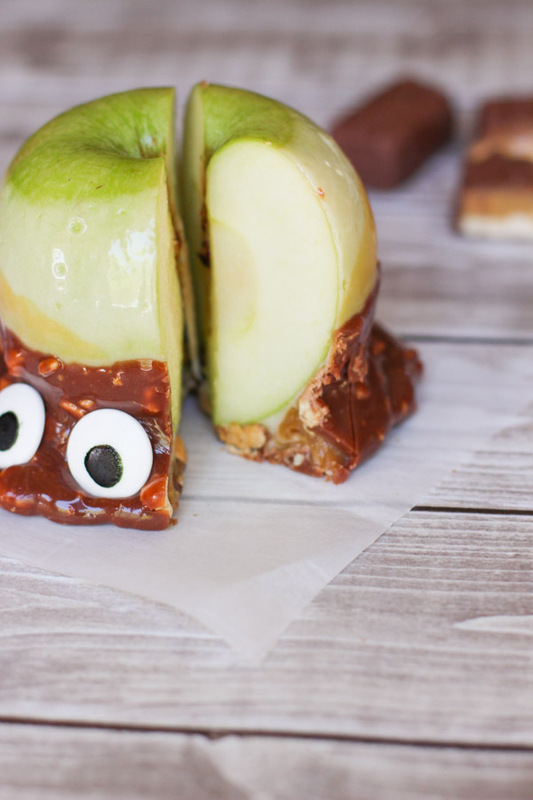 Layers of marshmallow, caramel, and SNICKERS® combine for the best monster you’ve ever tasted. 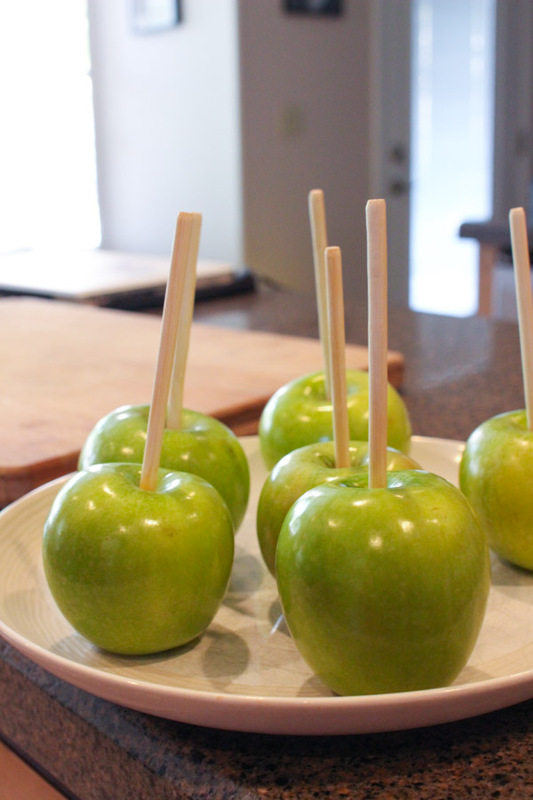 First, remove the stems from the apples and insert wooden sticks. Line a plate with wax paper and spray with cooking spray. If you don’t spray the paper, the marshmallow will stick. Melt marshmallows and butter together in a saucepan over medium heat. 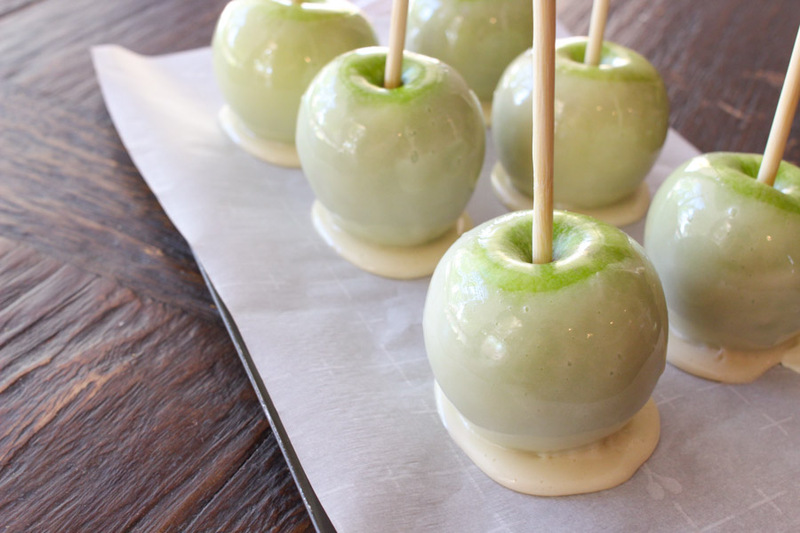 Dip each apple in the melted marshmallows, roll off excess and place on the greased wax paper. Unwrap the caramels and place in a saucepan with the 2 TBSP of water. Cook over medium heat until melted. Line plate with wax paper (no need to spray, chilled caramel pulls off easily). Dip marshmallow apples into caramel leaving a 1/2 inch of marshmallow exposed. You want that layered look. Twirl off excess caramel into pan and place onto wax paper lined plate. Unwrap SNICKERS® and chop each bar into small pieces. Place in a small microwaveable bowl. Heat in microwave for 1 minute at 50% power. Stir. Keep heating in 30-second increments at 50% power, stirring between heatings until melted. Prepare a wax paper lined plate one last time! 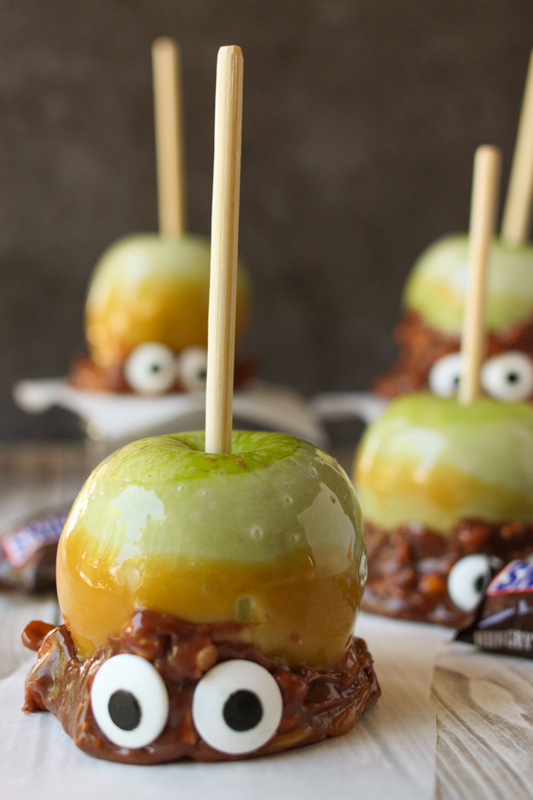 Dip the bottom-third of apple in melted SNICKERS®. Twirl off excess and place on wax paper. Immediately, press in two candy eyes. Refrigerate until hard (usually 30 min- 1 hour). Place in clear favor bags and tie off with a ribbon. You now have a monster apple for your BOO bag! One final element will make your BOO bag complete, and that’s the note! Your neighbor will need to know where this gift came from and what to do next. Visit BooItForward.com to print out your BOO’d card. Now that you have all the items, place them in your Halloween themed gift bag, pick a neighbor’s house and leave it at the door. If you have a neighborhood where most people enter through the garage, place it in front of the garage door. Make sure it’s to the side so your neighbor doesn’t accidentally roll over it. This one tradition brightens our Halloween each year. 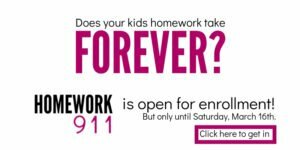 It’s great to do with kids because it takes the focus off receiving and onto giving – and when you can say that about Halloween? Tell me, will you start this new tradition this year?